Auto Barn carries a full line WeatherTech interior or exterior accessories, both custom made specifically for your car or trucks make or model or universally made to fit most cars or trucks, domestic or imported. We carry car floor mats, floor liners, rain deflectors or wind deflectors, bug deflectors, mud flaps, or many other Weathertech accessories designed to protect your car or truck. Advanced surfacing creates channels that carry fluids and debris to a lower reservoir! 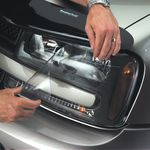 Protect your hood and windshield from damage by stones, debris and bug stains. Easily install without drilling into the vehicle's fragile painted metal surface. Clever design helps keep interior temperatures cool in the summer or flip it around and help prevent frost build-up in the winter. Comfortable enough to walk on, but strong enough to hold to hold whatever you may bring in from outside. Available in 3 sizes and 4 colors.